Madhuri Dixit and Karan Johar ready to judge Jhalak Dikhla Jaa 5! Actress Madhuri Dixit and director Karan Johar are all set to judge the fifth season of the popular dance reality show, Jhalak Dikhla Jaa from 16th June. The show was launched today with all the 16 contestants being introduced. The list of contestants this year includes TV actors, VJ, Cricketer and even a Comedian! At the launch Madhuri said that grace and expressions is what will she will be looking at while judging the contestants. While Karan Johar said that more than anything else he hopes to fulfill his dream of dancing with Madhuri Dixit. Well, he hope so too Karan! The third judge for the show is choreographer and director Remo D’souza. Jhalak Dikhla Jaa will air on Colors TV from 16th June at 9 PM. The list of contestants include Gurmeet Chowdhury, Pratyusha Banerjee, Sanath Jayasuriya, Archana Vijaya, Giaa Manek, Darsheel Safary, Bharti Singh, Ravi Kissen, Jayati Bhatia, Talat Aziz, Isha Sharvani and Shibani Dandekar. 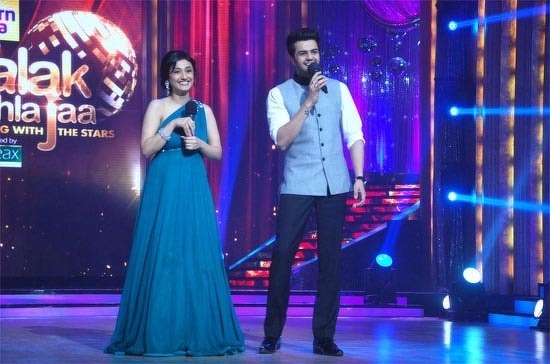 The show will be hosted by Ragini Khanna and Manish Paul. Here are some pictures and video from Jhalak Dikhla Jaa 5 launch. Watch Madhuri Dixit In Jhalak Dikhla Jaa 5 Promos! Madhuri and Rani dance together on Jhalak Dikhla Jaa! Jhalak Dikhla Jaa 5 to start from 16th June – Meet the contestants! Jhalak Dikhla Jaa 5: Darsheel floors Madhuri, Priyanka!